Because I’m lazy I wanted to have them all in one place, I’m pulling my earliest movie quiz posts from the old blog archive and placing them on my current. I’ll dust them off and add a bit of images and exposition to them, but the answers will remain the same. Besides, with the start of summer, this one from mid-July, 2009 was tailor-made for today. Professor Severus Snapes’ Sorcerer-tastic, Muggalicious Mid-Summer Movie Quiz. Whew… The rules called for all submissions to be made in the post’s comment section (which I did), but I’ll copy it here. Without further delay, below are my answers. » Spartacus — Dr. Strangelove or: How I Learned to Stop Worrying and Love the Bomb would be my first. What can I say? I love Kubrick’s work from the 60s. » Remakes of good original films by talentless studio execs/producers. » Without a doubt, it is Bronco Billy. While I may enjoy viewing both, I love without hesitation this little gem. You won’t find me siding with an 80s film over one from the 70s, but with Clint in a saddle (and at the helm), with a six-shooter in hand, mashing up screwball comedy and the modern western, how can I not? » Twelve O’Clock High — see my guest post colleague’s classic review on why that is. » Joseph Tura (Jack Benny). » So much so (not the least of which, causing me motion sickness while sitting still!). » If I ignore the Japanese monster flicks (Godzilla, Mothra, etc.) from the 50s, it was Seven Samurai. » Mr. Moto (Peter Lorre) — though, I pick him because I like Lorre. I’m not in the practice of accepting stereotypes as performance art, though. » Patton — years ago, I probably would have answered with The Bridge Over The River Kwai. But then I read more about the Burma-Siam Railroad and the veterans who survived internment and have quite a different view toward David Lean’s film, that changed. » Michael Bay for Revenge of the Fallen – the use of stereotypes/language for the twin characters Skids and Mudflap. » Either The Wild Bunch or Butch Cassidy and the Sundance Kid — two diametrically different takes on the changing times in the West on those outside of the law. » The Long Goodbye — MASH would be first. » Mona Lisa Vito (Marisa Tomei) — I don’t care what anyone says, I love her in that role. » I don’t feel qualified to judge as I’ve never lived in a small town, but ideally I’d like it to be It’s a Wonderful Life. » The Godfather: Part II — I’ll cheat here by saying The Godfather: A Novel for Television aka Godfather Saga would be first. » The underrated Gunn from 1967. » The Train station shoot-out, in a wonderful homage to Battleship Potemkin and the Odessa Steps, from The Untouchables. » The move to color moment from The Wizard of Oz. » Crash Davis (Kevin Costner) — sorry, but it’s not a contest. Morris didn’t end up with Annie Savoy (Susan Sarandon) as Crash did. » Vicky Cristina Barcelona (I’m not a big Woody Allen fan, though). » Sam Raimi’s The Quick and the Dead. » Irene Bullock (Carole Lombard). » I agree with commenter Bill C, it is the Anything Goes musical dance number from Temple of Doom (and the single best thing in that movie). » Humphrey Bogart, Cary Grant, Bette Davis, Clint Eastwood, James Stewart. 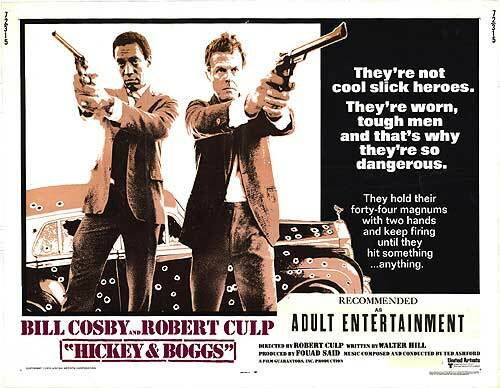 I’ve got to get my hands on Hickey & Boggs!! Bill Cosby? Oh, yes. I heartily agree. It’s one of the best neo-noirs from the 70s. Thanks so much for the read and comment, Chris. Jeez! You’re not making things and easier, are you? Always the sign of a great quiz! #1/: Second favorite Kubrick film? ‘The Killing’. The grimy heist gone bad film all others aspire to be. And fail for the most part. #2/: Most significant/important/interesting trend in movies over the past decade, for good or evil? IMAX, 3D and ‘Shaky Cam’ are all inherently EVIL! IMAX gives me headaches. 3D and ‘Shaky Cam’ make me nauseous. #3/: Bronco Billy (Clint Eastwood) or Buffalo Bill Cody (Paul Newman)? Bronco Billy. An anachronism whose code still rings true today. Not too shabby for a shoe salesman. #4/: Best Film of 1949? Cannot disagree with ’12 o’ Clock High’. Gregory Peck at his spit and polish best! #5/: Joseph Tura (Jack Benny) or Oscar Jaffe (John Barrymore)? Jack Benny. His well honed sense of comedic timing cannot be topped! #6/: Has the hand-held shaky-cam directorial style become a visual cliché? God, I hope so! It needs to burn in Hell!!! #7/: What was the first foreign-language film you ever saw? ‘The Battle of Algiers’ (1966) Pontecorvo’s best work! His earlier ‘Kapo’ comes in around third or fourth. #8/: Charlie Chan (Warner Oland) or Mr. Moto (Peter Lorre)? Warner Oland. My local TV station made a cottage industry out of playing his films on Saturday evenings. #9/: Favorite World War II drama (1950-1970)? ‘Hell is for Heroes’. Steve McQueen at his functionally mute, reactive best. Though ‘Patton’ is still some of George C. Scott’s best work! #10/: Favorite animal movie star? Asta from ‘The Thin Man’ series. The perfect four legged progeny for Nick and Nora Charles. #11/: Who or whatever is to blame, name an irresponsible moment in cinema? Michael Bay. For his ridiculously error filled ‘Pearl Harbor’. A film that didn’t need conceived, negotiated, executed or made! #12/: Best Film of 1969? ‘Easy Rider’. The delivery vehicle for a surfeit of future talent. Also quietly proves that Roger Corman was way ahead of his time for films! #13/: Name the last movie you saw theatrically, and also on DVD or Blu-ray? ‘The Return of the Dark Knight’. (DVD) Warner Brothers animation smooths out and also enhances Frank Miller’s iconic work! #14/: Second-favorite Robert Altman film? ‘McCabe and Mrs. Miller’ With ‘Gosford Park’ trailing close behind. #15/: What is your favorite independent outlet for reading about movies, either online or in print? IMDb: For all things film. imfdb. org: (Internet Firearms Data Base) For firearms in television and film. #16/: Who wins? Angela Mao or Meiko Kaji? Angela Mao. Credits include ‘Enter the Dragon’. Though Meiko Kaji would make an awesome Lady Shiva in ‘The Dark Knight’ franchise. #17/: Mona Lisa Vito (Marisa Tomei) or Olive Neal (Jennifer Tilly)? Has to be Jennifer Tilly’s Olive in ‘Bound’. She first caught my eye as gangster, Paul ‘The Wall’ Srignoli’s wife in ‘Hill Street Blues’. #18/: Favorite movie that features a carnival setting or sequence? ‘Carnival of Souls’ is a great answer. Though mine would be ‘Nightmare Alley’. A creepy rags to riches to rags tale. With sideshow geeks! With ‘Strangers on a Train’ close behind. #19/: Best use of high-definition video on the big screen to date? ‘Sin City’. With ‘300’ a close second. #20/: Favorite movie that is equal parts genre film and a deconstruction or consideration of that same genre? Arthur Penn’s ‘Night Moves’ from 1975 with Gene Hackman. Tears apart. Rebuilds and tears apart again the ‘Private Eye’ genre and mystique. #21/: Best Film of 1979? Has to be ‘All That Jazz’. Roy Scheider plays Fosse flawlessly in a film far ahead of its time! #22/: Most realistic and/or sincere depiction of small-town life in the movies? Hitchcock’s ‘Shadow of a Doubt’. 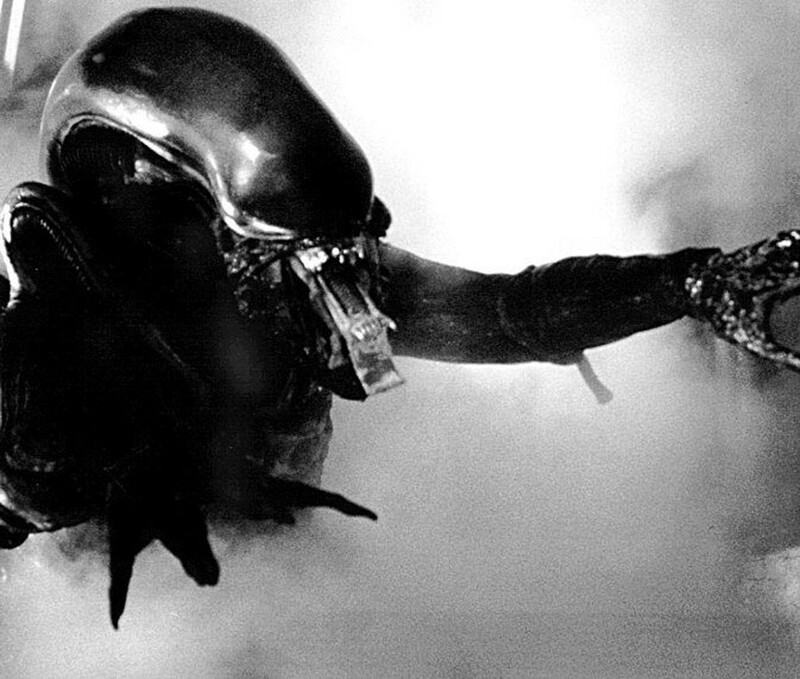 #23/: Best horror movie creature (non-giant division)? My favorite is the ‘Crash’ Corrrigan Guy in a Rubber Suit, ‘It! The Terror from beyond Space’. Best would be the Metalunan from ‘This Island Earth’. #24/: Second-favorite Francis Ford Coppola film? ‘You’re a Big Boy Now’ from 1966. Coppola’s first non ‘Roger Corman Commando’ film. Funny, lighthearted and shows great potential to come. #25/: Name a one-off movie that could have produced a franchise you would have wanted to see? Would love to have seen a spin off franchise of the staff and patients of the mental hospital and castle that held William Peter Blatty’s ‘The Ninth Configuration’ from 1980 together! #26/: Favorite sequence from a Brian De Palma film? John Travolta finally finding his “Scream Queen” in the end of ‘Blow Out’. #27/: Favorite moment in three-strip Technicolor? #28/: Favorite Alan Smithee film? ‘The Challenge’ 1970 ABC made for TV movie with Darren McGavin and Mako fighting for a downed spy satellite on a Pacific island. #29/: Crash Davis (Kevin Costner) or Morris Buttermaker (Walter Matthau)? Crash Davis. I really liked his correct JFK assassination theory. #30/: Best post-Crimes and Misdemeanors Woody Allen film? #31/: Best Film of 1999? #32/: Favorite movie tag line? “They don’t call them that for nothing!” Dirty Mary Crazy Larry. Budd Boetticher’s ‘The Tall T’. With Peckinpah’s ‘Ride the High Country’ a close second. #34/: Overall, the author best served by movie adaptations of her or his work? Though I lean heavily toward John leCarre and Robert Stone for fidelity. #35/: Susan Vance (Katharine Hepburn) or Irene Bullock (Carole Lombard)? #36/: Favorite musical cameo in a non-musical movie? You nailed it! Though I do enjoy the Bruce Willis and Danny Aiello duets in ‘Hudson Hawk’. #37/: Bruno (the character, if you haven’t seen the movie, or the film, if you have): subversive satire or purveyor of stereotyping? Neither. Don’t care for Sasha Cohen. Roger Corman, Alfred Hitchcock, Myrna Loy, Jon Polito and Peter O’Toole. Just to pick their brains and bask in the conversations! As usual, some fantastic quiz answers, Kevin. Great to hear you’re another fan of ‘Bronco Billy’, ‘All That Jazz’, and ‘The Challenge’ TV movie. Why am I not surprised with your answer to #4 ;-). Oooo… must bookmark imfdb.org (when I get home, though, as my work’s internet filters prevent me from gazing at it now). Thanks so much for putting yours here, my friend. Nice choice on the Brian De Palma sequence from The Untouchables. Probably one of my favorites as well, along with the prom queen sequence in Carrie. Oh, that’s another great one, too. Many thanks :-).